We aren't craft beer experts…we just know what we like! Your November tasting events are almost here! This month, we’re bringing you seven different Saint Arnold Brewing Co. selections as the brewery approaches their 2nd year as the official beer sponsor of Galveston’s beloved Dickens on the Strand event. Tasting-goers are also invited to share in the holiday spirit of giving by taking part in Del Papa’s holiday GI Joe/GI Jane drive. Each tasting location will accept donations of nonperishable goods — including games, reading materials, personal hygiene products and snack foods — for military personnel based overseas. All tastings run from 5 to 7 pm this Thursday, November 20th and are free and open to adults ages 21 and older. • Saint Arnold Sailing Santa – Sailing Santa was born when Saint Arnold fans requested that they blend half a pint of Elissa IPA with half a pint of Christmas Ale. Saint Arnold took note, and after a few slight tweaks introduced this seasonal ale. The result is a spiced beer that is great to drink alone or with your favorite holiday foods. • Saint Arnold Christmas Ale – A rich, hearty ale perfect for the holiday season with a malty sweetness and spicy hop character. The generous use of five different malts is responsible for the full flavor and high alcohol level of this beer. • Saint Arnold Elissa – A traditional India Pale Ale, the Elissa IPA is very hoppy with a properly balanced malty body. Elissa has huge hop additions in the kettle that give it a wonderful bitterness and is then dry-hopped in the fermenter to create the pleasant floral, hoppy nose. Saint Arnold’s reverse osmosis water makes the bitter very soft with no harsh notes to it. 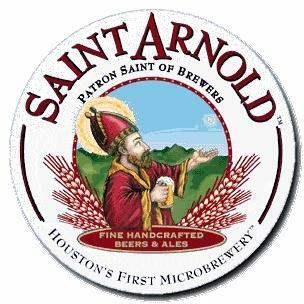 • Saint Arnold Icon Gold – This golden slightly hazy beer has a nice creamy head with a lightly fruity aroma. The taste starts with a light hoppy bitter that carries through to the finish although never coming on too strong. The wheat malt provides a soft body that complements the hops while remaining light. The beer is highly refreshing with a nice hop finish that makes you want another sip. • Saint Arnold Endeavour – Endeavour brew pours a deep amber with a light, creamy head that is only the start to an extremely satisfying double IPA experience. The nose starts off with a touch of citrus, but then takes a turn into a flavor full of nectar and peaches. The hop bitter is quiet at the start, building to a much more impactful crescendo while maintaining a delicate balance even in its big finish. • Saint Arnold Ale Wagger – A beautiful, deep copper brown ale. It has a full, malty body with hints of chocolate, a touch of sweetness and a light hop flavor. A complex malt character is created by combining five different types of malts. It has a rich, creamy head with a fine lace. The light fruitiness, characteristic of ales, is derived from a proprietary yeast strain. A portion of sales of Ale Wagger are donated to support local rescue organizations to improve the lives of animals. • Saint Arnold Santo – The brewers refer to Santo as a “black Kölsch.” Essentially it is brewed using a Kölsch recipe with the addition of Munich and black malt. It is light bodied and floral yet with a distinct dark malt flavor. 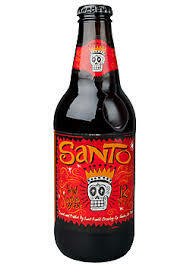 Santo is dark, yet refreshing. It’s that time again – tasting time! Tasting time is upon us once again and this month’s lineups are looking goooood. Boiler Room Berliner Weisse – This is a light bodied but surprisingly flavorful sour wheat beer. The sourness is created by souring the wort prior to boiling and fermentation giving the nose of the beer a light hop note and distinct funkiness. The sweet malt taste quickly goes into a tart body and finish while the sour and malt flavors stay well-balanced to the end of the tasting experience. Summer Pils – A true bohemian-style pilsner, Summer Pils is crisp, refreshing and perfect for a hot summer day. It has a delicate, sweet malt taste complemented by an abundant hop aroma and flavor. This beer is brewed with a fine German malt and a copious amount of “noble” hops imported from the Czech Republic. Icon Blue – This Brown Porter is a dark, medium bodied ale with rich chocolate malt notes. Icon Blue pours a dark brown color with ruby and garnet highlights, producing an off-white head. During the brewing process, the brewers used English malt hops and their own Saint Arnold yeast, also hailing from the U.K.
Santo – Saint Arnold considers Santo a “black Kölsch.” Brewed using a Kölsch recipe with the addition of Munich and black malts, it is both light bodied and floral with a distinct malt flavor. Amber Ale – A well balanced, full flavored amber ale with a rich, malty body and pleasant caramel character derived from a specialty Caravienne malt. Amber has a complex hop aroma, with floral and citrus hints and a light frutiness derived from a proprietary yeast strain. Saint Arnold Elissa IPA – A traditional IPA, this beer is very hoppy with a properly balanced, malty body. Its huge hop additions in the kettle give it a wonderful bitterness and it is dry hopped in the fermenter to create its pleasant, hoppy nose. Elissa is named after the tall ship currently moored at the Texas Seaport Museum in Galveston. Saint Arnold donates a portion of the proceeds from sales of this IPA to the Galveston Historical Foundation for preservation of this ship. Saint Arnold Boiler Room Berliner Weisse – This is a light bodied but surprisingly flavorful sour wheat beer. The sourness is created by souring the wort prior to boiling and fermentation giving the nose of the beer a light hop note and distinct funkiness. The sweet malt taste quickly goes into a tart body and finish while the sour and malt flavors stay well-balanced to the end of the tasting experience. Saint Arnold Summer Pils – A true bohemian-style pilsner, Summer Pils is crisp, refreshing and perfect for a hot summer day. It has a delicate, sweet malt taste complemented by an abundant hop aroma and flavor. This beer is brewed with a fine German malt and a copious amount of “noble” hops imported from the Czech Republic. 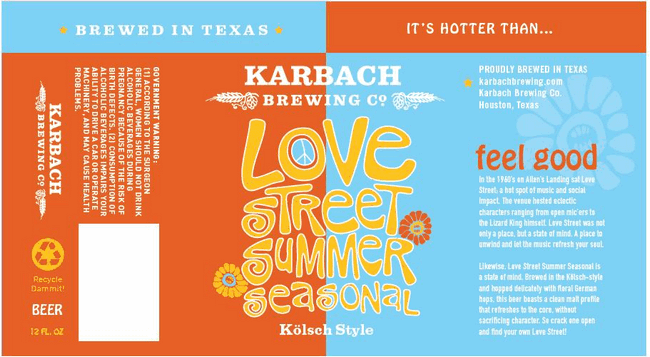 Karbach Summer Love Street – This beer is brewed in the Kolsch-style with delicate, floral German hops. Love Street boasts a clean malt profile that refreshes to the core, without sacrificing character. This is the perfect beer to unwind with at a sunny summer music festival or other outdoor event. 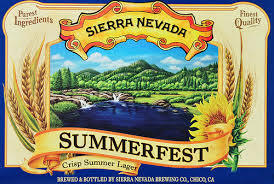 Sierra Nevada Summerfest – With a nod toward the original Czech tradition, Summerfest is brewed to feature the best of Bohemian nature. Crisp, golden, dry and incredibly drinkable, Summerfest has a delicate and complex malt flavor and spicy, floral hop character – making it the perfect warm weather beer. 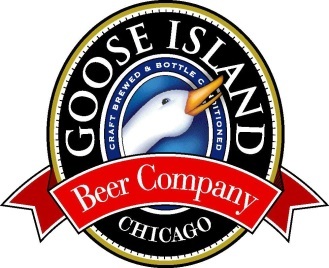 Goose Island The Illinois – Illinois is a 9.0% ABV 95 IBU Imperial IPA that pushes the limits of hop flavor and aroma. It pours a deep gold color with a complex citrus aroma. The taste is balanced with a clean bitterness and a medium to full body. Johnny Appleseed – This refreshing hard apple cider has a 5.5% ABV and is best enjoyed on the rocks to bring out the full, crisp apple taste. Crafted in Baldwinsville, New York, it is made with apple juice sourced from apples in the U.S. and fine orchards around the globe, as well as cider yeast and other natural ingredients. 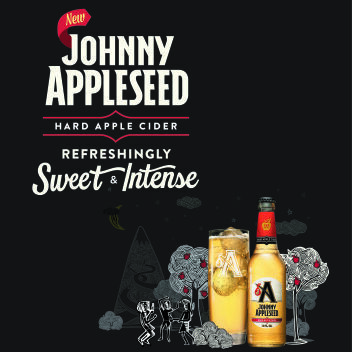 With the perfect balance of sweetness and intensity and a refreshing, crisp apple bite, Johnny Appleseed is unlike any other hard cider on the market today. Hope to see ya’ll there, Pint Jockeys! All tastings run from 5-7PM and are free and open to adults ages 21 and older. Locations for all three tastings are posted below. Get ready for your February tasting events! This Thursday’s tasting events feature great beers from some of your favorite breweries. Folks in Beaumont will enjoy six different selections from Texas Big Beer Brewery and have the exciting chance to meet Texas Big Beer Brewery founders and brewers “Johnny Max” and “The Queen” McKissack. Big Texas Blonde – This Belgian Strong Pale Ale with a 10.54% ABV content pours an orangey-tan colored hue with a cloudy body. The aroma of this beer is full of bread, fruit and candy notes while the taste is equally complex and interesting with present flavors including dough, fruit, honey caramel and more. Working Stiff Ale – Brewed in the style of an Extra Special Bitter and named for the “premium ales” of the working class in the London pubs in the 1800s, this beer pours a copper color with a frothy white head. Aromas from this medium-bodied brew include caramel malts and floral hops and the taste is founded on a solid backbone of malt and earthy hops. The finish is smooth with moderate bitterness. Renaissance Cowboy – A “wee heavy” Scotch Ale, this brew pours a deep amber-brown with a light brown frothy head. The aroma is full of heavy malts with brown sugar, molasses and dark fruity notes. The body is medium and thick with a sweet, malty base and sweet, smooth finish. Beeriac IPA – An American IPA with a thick, hazy amber and copper-colored body that leaves a thick, frothy head with substantial lacing when poured. Beeriac’s aroma is full of orangey, citrus notes mixed with light pine notes, caramel sweetness and tons of hops. The flavor profile includes citrus tastes followed by sweet caramel flavors with a medium mouthfeel and carbonation. Texas Crude – This American Porter’s aroma is heavy on the vanilla with other hints of sweet chocolate and toffee. The taste is smooth with sweet malt and toffee flavors and a medium body with light carbonation. Bitter hop tastes follow through to a dry yet satisfying finish. White Chocolate Porter – What’s better than beer and chocolate? This rich, dark ale pours almost black with a nice tan head. You’ll notice coffee on the nose, while white chocolate flavors come out gradually as you sip, followed by a pleasing, hoppy-bitter finish. Karbach Barn Burner Saison – This beer is sure to get you thinking about Spring with its effervescent golden color and hints of citrus and spice. The brew uses a unique yeast strain and fresh Texas-grown grapefruit to give it a refreshing and zesty character, without sacrificing depth of flavor. Saint Arnold Spring Bock – An authentic, German-style Bock, celebrating the coming of spring, this robust, deeply flavored lager has been aged to create a smooth, malty taste with a hint of sweetness. A light addition of German hops balances the malt flavor. Rahr & Sons Iron Thistle – This dark, Scottish ale has a bold taste dominated by a smooth, sweet maltiness balanced with a low, hoppy bitterness. Rahr’s first-ever National Grand Champion winner, this one is sure to make you want to break out your bagpipes and lederhosen in celebration. Rogue Ales 7 Hop IPA – With a slightly hazy, golden-orange body, this ale boasts a foamy head and plentiful lacing when poured. Tangerine and grapefruit rind aromas are met with notes of spruce, caramel and bready malts while flavors are heavy on the citrus with other tastes of spruce, pine resin and herbal hops in the mix. The ale is nicely balanced and leaves behind a lingering bitterness. Dixie Brewing Company Dixie Lager – Brewed all-naturally today as it was first brewed in 1907, Dixie Lager uses lightly roasted two-row barley malts and rice. The result is a crisp and flavorful beer with a mild Cascade hop finish. A century of New Orleans’ brewing tradition lives today in every bottle and keg of Dixie Lager. Goose Island Ten Hills APA – Ten Hills American Pale Ale takes its name from the original planting of ten “hills” of hops a couple of years ago when Elk Mountain Farms first formed a business relationship with Goose Island. Today, more than 200,000 hills of hops are grown for Goose Island annually. A limited release, this ale has an apricot and tangerine aroma, tasting of sweet honey and toast and finishing with an earthy, herbal hop character. Saint Arnold Bishop’s Barrel No. 6 – The latest in the brewery’s Bishop’s Barrel line, “BB6” is Saint Arnold’s Imperial Pumpkin Stout aged in rum barrels. The taste begins with sweet malt, chocolate and spices then comes a warming rum finish. Pumpkin creates a pleasant body to this beer which holds up to the onslaught of flavors. As it warms, all of the flavors become rounder and fuller. Saint Arnold Fancy Lawnmower – This beer is crisp and refreshing, with a sweet, malty body balanced by a complex citrus hop character. The brew is light enough to be enjoyed by Texans after even the most strenuous of activities, like mowing the lawn. Saint Arnold Santo – Saint Arnold considers Santo a “black Kölsch.” Brewed using a Kölsch recipe with the addition of Munich and black malts, it is both light bodied and floral with a distinct malt flavor. Saint Arnold Elissa IPA – A traditional IPA, this beer is very hoppy with a properly balanced, malty body. Its huge hop additions in the kettle give it a wonderful bitterness and it is dry hopped in the fermenter to create its pleasant, hoppy nose. Saint Arnold Endeavour – This double IPA is a deep amber color with a light, creamy head. The taste starts off with a creamy malt and the hop bitter starts low, building to a crescendo but always maintaining balance – even in its big finish. You’ll taste citrus and peach notes throughout. There you have it, Pint Jockeys! We sincerely hope to see you at one of our three tasting locations this Thursday. All tastings run from 5-7PM and are free and open to adults ages 21 and older. Locations for all three tastings are posted below. We’ll see you there! It’s the MOST wonderful time of the year, indeed. Saint Arnold Brewing Co. is sponsoring this weekend’s Dickens on the Strand festival in conjunction with the Galveston Historical Foundation, bringing five of its best brews down to the island for your enjoyment. Have you ever been to the festival? If so, we know you’ve marked your calendar to attend once again. If not, you seriously need to see this! 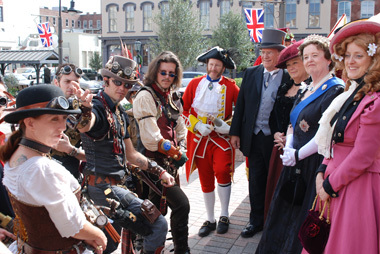 This world-famous holiday event, nowin its 40th year, transforms downtown Galveston into 19th century London at Christmastime. Sights to be seen include parades, non-stop entertainment on five stages, strolling carolers, roving musicians, bagpipers, jugglers and a host of other entertainers. Costumed vendors will peddle their wares from street stalls and rolling carts laden with holiday food and drink, Victorian-inspired crafts, clothing, jewelry, holiday decorations and gift items… and of course, FIVE different Saint Arnold brews will be available to help celebrate the season. We’ll see you there, Pint Jockeys! 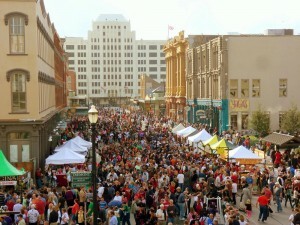 Cheers to a great holiday festival and great Texas craft beer! Amber – This is a well-balanced, full-flavored amber ale. It has a rich, malty body with a pleasant caramel character derived from a specialty Caravienne malt. Its light fruitiness, characteristic of ales, is derived from a proprietary yeast strain. Christmas Ale – This rich, hearty ale is perfect for the holiday season, with a malty sweetness and spicy hop character. It pairs well with many of your favorite holiday eats including fruit cake, Christmas pudding and squash bisque. Elissa – A traditional India Pale Ale, the Elissa IPA is very hoppy with a properly balanced malty body. Elissa has huge hop additions in the kettle that give it a wonderful bitterness and is then dry-hopped in the fermenter to create the pleasant floral, hoppy nose. Saint Arnold’s reverse osmosis water makes the bitter very soft with no harsh notes to it. Lawnmower – This beer is crisp and refreshing, with a sweet, malty body balanced by a complex citrus hop character. The brew is light enough to be enjoyed by Texans after even the most strenuous of activities, like mowing the lawn. Your November tasting lineups + GI Joe / GI Jane program donation info. Hey there, Pint Jockeys! Tasting week is finally here and today we’re posting the lineups at all three tastings. We’re also revealing details on a special guest scheduled to appear at our Beaumont event and letting you know how you can participate in our GI Joe/GI Jane donation drive for our armed forces overseas. Oh, and did we mention that we’re giving away FREE tickets to the upcoming Dickens on the Strand Festival at our Beaumont and Texas City tastings? We can assure you, this is not all too good to be true! Let’s dive right into it with the big reveal: Rahr & Sons founder Fritz Rahr will be on-hand at this Thursday’s Beaumont tasting! Blonde – Rahr’s Blonde Lager was the first beer to come out of Rahr & Sons Brewing Company. It is a medium-bodied traditional Munich Helles-style pale lager that features a rounded maltiness without being too heavy. And like every proud Texan, it has a good head and is pleasant – but not overly sweet. Texas Red – Texas Red has a well-balanced flavor. The notes of caramel and its sound malt character are perfectly balanced with just a bit of hops. This is a super-smooth, very drinkable beer. La Grange – La Grange is a sturdy, complex farmhouse ale with a myriad of esters ranging from fruit-like aromas to earthy yeast tones. It is dry and refreshing, perfect for quenching your thirst after a long day. Angry Goat – Angry Goat pours a cloudy, dark, ruddy brown hue that some describe as a murky tea color. Expect aromas of banana, clove, dark fruits and a hint of roasted grain. Tastes include a big wave of molasses and dark brown sugar, giving the brew a defining richness, while a pinch of cocoa adds a layer of sweet complexity. Tastes end on a spicy note with a touch of warming and comforting creaminess. Stormcloud – During a fierce storm on his voyage across the ocean, William Rahr could be heard yelling from the tall-masted ship: “Roll on old sea! And when you are done, when the storm clouds have destroyed themselves, we will still be standing and drinking!” Rahr & Sons has created the ultimate ale for a voyage such as this: A German-Style IPA – a traditional India Pale Ale with German Influence. Winter Warmer – This seasonal release is sure to melt even the coldest of hearts. Pouring a dark, almost opaque brown, this beer is packed with roasted malts and bold flavors. Tasters will pick up on a fair amount of English hops and scents of dark stone fruits and light smoke. With a pleasantly mild carbonation, this is one full-bodied brew you can sip on all night at your next holiday party. Ugly Pug – Unlike most dark beers that are often described as “heavy” or “chewy”, Rahr’s Ugly Pug has a surprisingly light body. Sometimes referred to as “nirvana in a bottle”, it combines their three amazing flavors: coffee, hints of chocolate, and of course BEER! Our Victoria and Beaumont tasters can expect a STACKED lineup as well. Attendees will sample six different beers from some of the biggest names in the business including Saint Arnold Brewing Company, Karbach Brewing Company, Stella Artois and Goose Island. Saint Arnold Icon Red – Saint Arnold adds a Bohemian Pils to their “Icon” series with Icon Red. This beer starts with the distinctive Saaz hop nose, then a pleasant maltiness for such a light beer followed by a floral, spicy and earthy hop flavor that closes with a focused bitter finish. Saint Arnold Sailing Santa – Sailing Santa was born when Saint Arnold fans requested that they blend half a pint of Elissa IPA with half a pint of Christmas Ale. Saint Arnold took note, and after a few slight tweaks introduced this seasonal ale. The result is a spiced beer that is great to drink alone or with your favorite holiday foods. 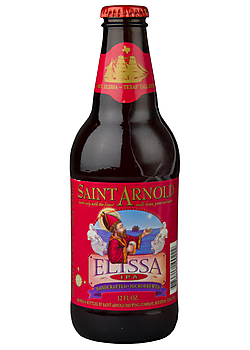 Saint Arnold Elissa – A traditional India Pale Ale, the Elissa IPA is very hoppy with a properly balanced malty body. Elissa has huge hop additions in the kettle that give it a wonderful bitterness and is then dry-hopped in the fermenter to create the pleasant floral, hoppy nose. Saint Arnold’s reverse osmosis water makes the bitter very soft with no harsh notes to it. Karbach Yule Shoot Your Eye Out – This seasonal, “Winter Warmer” style beer is loaded with specialty malts, fresh ginger, cocoa nibs, orange peel and other holiday spices. Only brewed in limited quantities, you’ll want to put this at the very top of your wish list to Santa this year. 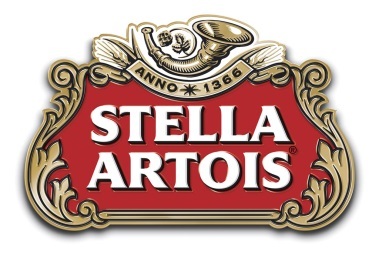 Stella Artois – Stella Artois is part of a Belgian brewing tradition dating back to 1366. It is the number one Belgian beer in the world and is present in over 80 countries. Defined as a bottom filtered, blonde pilsner, it is thirst quenching with a malty middle and crisp finish delivering a full flavor and a hint of bitterness. Stella Artois is best enjoyed served between 3 and 5 degree Celsius and should be served in the unique Stella Artois Chalice. Goose Island Sixth Day Festive Brown Ale – Malty, rich and warming, this festive Brown Ale from Goose Island is sure to keep you feeling cozy even on the coldest of winter days. It pours a dark mahogany brown with a tinted cream and smells like sweet toasty malt and a hint of molasses and sugar. This ale is full-bodied and dense with a clean finish packed with smoky malts. Your homework this week: to memorize this chart. Welcome to week four of Beer School! You’ve made it halfway through the course, so with only two weeks remaining, we toast to you, Pint Jockeys. In today’s lesson, we’ll take a look at the difference between the American and English interpretations of a worldwide favorite – the Indian Pale Ale. But first, a little moniker history. Back in the early 18th century, the British exported pale ales to their troops in India. In an effort to preserve the beer during its long ocean journey, brewers added extra hops and, ipso facto, created a brand new and now very popular type of beer called, fittingly, the India Pale Ale, or IPA. Pop quiz time! We’ve learned about lagers, amber ales, blonde ales and now Indian Pale Ales. So tell us, which style of craft beer do you think rakes in the most sales in the US? You guessed it! According to one of our favorite blogs, Beervana, American IPAs account for 19.4% of US craft beer sales, which is more than any other single style of beer. While that may not have come as shock to us hopheads, Beervana says 2011 was the first year IPAs surpassed all other types! Ready for your homework? (PS, we were just kidding about the homework above.) Why don’t you grab your favorite American and English IPAs – we like Saint Arnold Elissa IPA (American) and Fuller’s IPA (English) – and drink up. Then, leave a comment below or on our Facebook page letting us know which you prefer and why. Bonus points of you tell us where you did your tasting. Don’t procrastinate! Do your homework soon. Our beer school minimester is almost over, and with just two more weeks of beer school lessons, graduation is on the horizon. What better way to cap off the course than by drinking more beer (and on someone else’s dime)? Join us for a graduation celebration at the September 20th Pint Jockeys tasting events in Victoria, Beaumont and Texas City! As always, we’ll post more details on the tastings here on the blog as we get them. In the meantime, make sure you’ve done all six weeks’ worth of homework, because the Pint Jockeys may give away prizes to our straight-A students! Cheers ‘til next time, compadres! Get ready for a Divine Lineup! 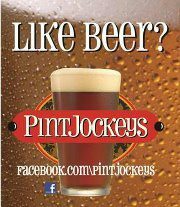 Happy humpday, Pint jockeys! Not only are you half way through the week, you’re another day closer to the August tasting events. And therefore, another day closer to getting a taste of the sought-after Divine Reserve #12 from Saint Arnold Brewing Company. That’s right, DR #12 will be featured at ALL THREE tasting events, so head out to the Del Papa Distributing Center near you and enjoy! Saint Arnold Divine Reserve 12 – The public is invited to get a taste of the highly-coveted, limited-edition Divine Reserve #12. Inspired by David Rogers’ victorious entry in the 2011 Big Batch Brew Bash, this Old Ale features a spicy malt and hop flavor and a high alcohol content. While the brewer suggests aging the beer for one to five years, allowing it to reach its full flavorful potential, the Pint Jockeys couldn’t wait to offer a taste. Now, beer fans can fulfill the urge to try the beer and allow their own personal stash to sit on the shelf a bit longer. All three locations will all get a taste of the recently brewed Saint Arnold’s Oktoberfest Ale. Saint Arnold Oktoberfest – A full bodied, malty and slightly sweet beer celebrating the autumn harvest. This rich beer has a round malt flavor and an above average alcohol content perfect for a cool fall evening. Saint Arnold Fancy Lawnmower – A true German-style Kölsch. It’s crisp and refreshing, yet has a sweet malty body that is balanced by a complex, citrus hop character. Multiple additions of German Hallertauer hops are used to achieve this delicate flavor. Special Kölsch yeast (an ale yeast that ferments at lager temperatures) gives the beer its slightly fruity, clean flavor. Saint Arnold Weedwacker – Weedwacker is Saint Arnold’s only unfiltered year-round beer. Fermented with Bavarian Hefeweizen yeast, it is light and refreshing but has a spicy clove note and banana esters. While it has a close relation to Lawnmower, it tastes completely different. Expect to see some yeast at the bottom of the bottle. 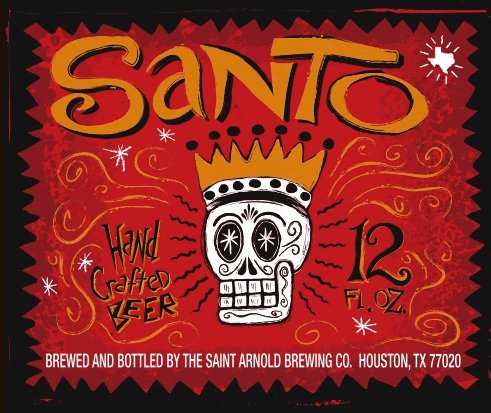 Saint Arnold Santo –Saint Arnold calls Santo a “black Kölsch,” which means it is brewed using a Kölsch recipe with the addition of Munich and black malt. It is light bodied and floral with a distinct dark malt flavor. It is a dark yet refreshing beer which pairs perfectly with a plate of enchiladas. Saint Arnold Elissa IPA – A traditional India Pale Ale, the Elissa IPA is very hoppy with a properly balanced malty body. The brew has a wonderful bitterness, and dry-hopping in the fermenter gives the brew a pleasant floral, hoppy nose. Saint Arnold Endeavour – This double IPA has a deep amber color with a light, creamy head. The nose starts off with a touch of citrus then turns decidedly into peaches. The flavor is characterized as a creamy malt, resulting from the pale 2 row, caramel malts and Saint Arnold yeast. The hop bitter starts low then builds to a crescendo, but always maintains a balance even in its big finish. If Texas City is too much of a hike, no need to worry. Event goers in Victoria and Beaumont will be treated to a varied lineup, stacked with delicious fall seasonals from Rahr & Sons, Shock Top and Sierra Nevada. Sierra Nevada Tumbler – Resembling the changing (and tumbling) leaves of fall, the Tumbler Autumn Brown Ale is gracefully smooth. Its warm character comes from malt roasting at the peak of its flavor. Rahr and Sons Gravel Road – A tribute to the laidback country lifestyle, this German-Style Sticke Altbier has an amber hue and medium carbonation with great balance between strong malt and hops. Shock Top Pumpkin Wheat – Traditional Belgian-style wheat ale brewed with ripe pumpkins and a variety of autumnal spices, including nutmeg, cinnamon and cloves. It’s the perfect way to spice up any fall celebration. Now that you’ve read up on all the brews, we trust you’ll arrive informed and extra thirsty. Tastings are free and run 5-7p.m. For more information, please visit our Facebook page and RSVP for the event.